Neck pain isn’t new, but it is certainly becoming more common. It almost seems like everyone will experience neck pain at some point in life. Can it be that our modern lifestyles are part of the problem? We’re going to look at three factors that are contributing to the increase in neck pain. Then we will discuss a safe and effective way to get natural relief. While stress alone is rarely the cause of neck pain, it does contribute to how common it is. We sit in traffic (which is stressful enough) just to get to a stressful job. Then there is the stressful drive home. If there is an argument in the house (which can easily happen when everyone is stressed), it may seem like there is no way to escape. But why does it make your neck hurt? There are several reasons. For one thing, stress releases hormones that can increase inflammation in the body, and inflammation causes pain. Second, we tend to store stress in our neck and shoulders. As a result, any underlying issues in the neck are made worse by stress. A simple misalignment may suddenly feel like stiffness or even a stabbing pain. Since alcohol and smoking both make neck pain worse, it is necessary to find positive ways to cope with stress. It may be a hobby, a short vacation, or just a bath and a good book. Keeping stress levels in check will help reduce the frequency and severity of neck pain. Of course, this won’t correct the underlying problem, but we will get to that soon enough. Most people used to work in what we would call blue collar jobs. Now, more and more people work in offices. Whether it is the setup of the desk, the type of chair being used, or the person’s posture, this can lead to long-term issues with the neck. The other factor is that many people who work in this type of environment live a sedentary lifestyle. Siting for the commute, sitting at a desk, sitting to unwind in front of the tv in the evening – it all adds up to joint pain in general, but especially in the neck. The best way to fight against this is to have an ergonomic office setup, learn some stretches you can do throughout the day, and find time to exercise whether it be at a gym or on your own. Also, focus on your posture because this will play a large role in the health of your neck and the rest of your spine. Text neck is a term used in the media to describe the effects of technology use on a person’s neck. Maybe instead of texting, you use your mobile devices for social media, video games, music, reading, or catching up with your favorite tv shows. How can the use of mobile devices have a negative effect on the neck? The head weighs 10-12 pounds. That’s no problem for the neck to handle. But when we crane our neck forward to look at a tiny screen that we often hold at waist level, it can put 60 pounds of pressure on the spine. Now multiply that by the dozens, if not hundreds, of times we check our phones throughout the day. You can see the effect that modern tech is having on the neck. What can you do to counteract this effect? Have some mobile-free time during the day. Commit not to check your phone over and over. Get a watch so you don’t use checking the time as your excuse. And when you do check your phone, hold it up higher so you are not craning your neck as much. What do you do when you have a stiff or sore neck? Do you take a shower or do some stretches? Maybe if it is really bad, you reach for a pain reliever. 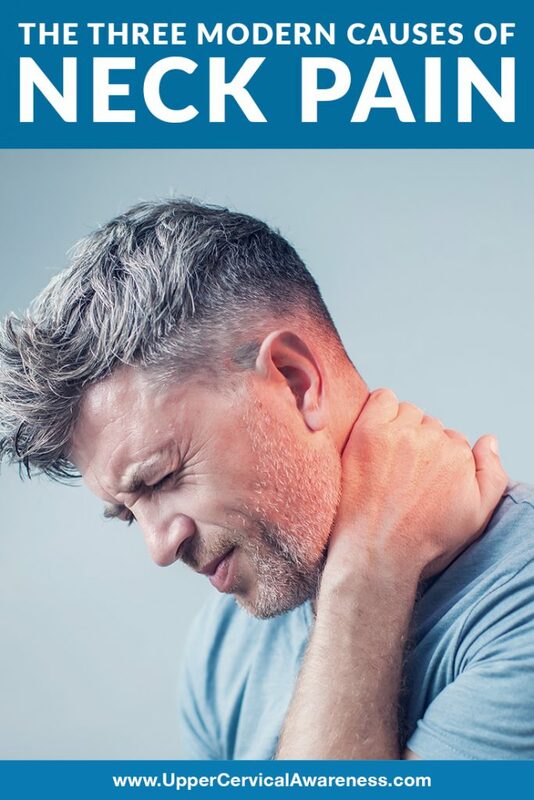 While some of these may offer a little temporary relief, you have to get to the root of the problem if you want to get rid of neck pain for good. Tiny misalignments of the upper cervical spine are often to blame. Even a slight misalignment throws off the balance of the head. Thus, the rest of the neck needs to start moving so that the head can stay straight. The shifts can affect the entire spine and pinch nerves that also affect the shoulders and arms. However, in the early stages, the stiffness may just be in the neck. Even if you find that the pain is worse in the morning and gradually lets up throughout the day, a misalignment may still be the problem. Don’t let it rob you of a good night’s rest. Upper cervical chiropractors specialize in detecting and correcting misalignments of the top two bones in the neck. Correcting this underlying issue can lead to long-term relief, especially once the soft tissue has a chance to heal and stabilize. To learn more about upper cervical chiropractic care, we encourage you to schedule a no-obligation consultation with a practitioner near you. If you are a good candidate for care, you may be surprised that a gentle adjustment, with no twisting or popping of the neck, is all that you need in order to get on the path to genuine relief.